SF Locksmith provide lock repair, lock replacement and lock fitting services to all types of clients, for all types of property. We also provide a 24 hour emergency locksmith call-out service if you find yourself having lock problems at any time of the day or night. All work is guaranteed and no payment is taken until the job has been completed to your satisfaction. With over 20 years of experience as a fully qualified locksmith, SF Locksmith can repair and replace locks to both doors and windows on all domestic properties. All materials which are supplied and fitted by ourselves come with a 2 year guarantee ensuring the customer's total confidence with the service that they have received. With no call-out fee, SF Locksmith are also Police registered, CRB checked and offer all surveys and quotations free of charge. We offer an extensive range of locksmith services for commercial properties throughout the Sheffield area, minimising disruption and helping them to run as smoothly as possible. Our services include warrants, repossesions and repairs to rental properties. Master key systems, high security commercial door locks, emergency exit hardware and door closers. All parts are approved and of the highest quality and fitted by a qualified and experienced engineer. Have you lost your keys or had the misfortune to be burgled? 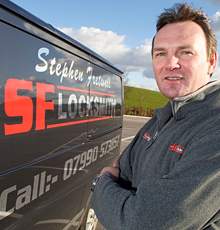 SF Locksmith operate a 24 hour emergency call-out service providing a lock repair, replacement and fitting service for all types of properties. Our extensive stock, carried at all times, means that no matter what type of lock you require, we will have the parts; and the work is usually completed in less than an hour. Contacted SFLocksmith Tuesday Evening, Wednesday lunch time job completed by a Professional. Ted Marston, Abbeydale Road South.